I hope you’ll never need it, but if you do, it’s there for you. 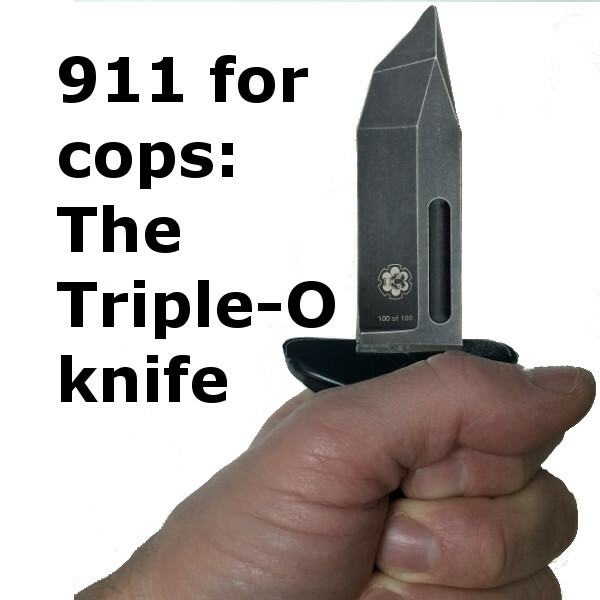 UPDATE: Triple-O knives are shipping same-business-day when you complete your order before 1600 Mountain time. 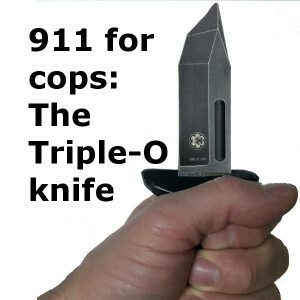 When are we on making the Triple-O available? Short answer: hoping for May. It’s being manufactured in China. I looked at doing it in the US like my other products, but discovered that the equipment was too expensive to obtain (at least in the short term) and outsourcing to a domestic manufacturer would cost nearly as much as I want to charge retail (!). It’s important to me to keep this within the reach of the average cop on the beat—including cops from small agencies outside of urban centers, who may well need it more due to lengthy response times. So it’s going to come from abroad until I can work out a cost effective way to do it here. This is a serious knife, about 3/16” thick 440C steel, flat ground for strength and piercing ability. The guard is there to keep your hand away from that blade even when you’re shoving it with all your strength against resistance. But despite that, it’s lightweight and compact enough to wear all day with the rest of your gear, and comes with a nice Kydex sheath to hang it from a load-bearing vest. A belt clip will also be available. The pictures you see of my prototype don’t do it justice—I have some blade samples from this factory, and they are better than I could make myself, so I’m really looking forward to the finished product. Sadly for availability, it turns out the Chinese are taking the month of February off for Chinese New Year. Which sounds like fun for them! But the plan is to get a first production run started once they’re back, and hope to have it over here around May. The first 100 knives and sheaths will be specially marked, and made available to our newsletter subscribers before anyone else, and with a special discount and a chance to win Triple-O #1. I hope you’ll consider it for the cop or soldier in your life, or to stick on your own belt or vest just in case.